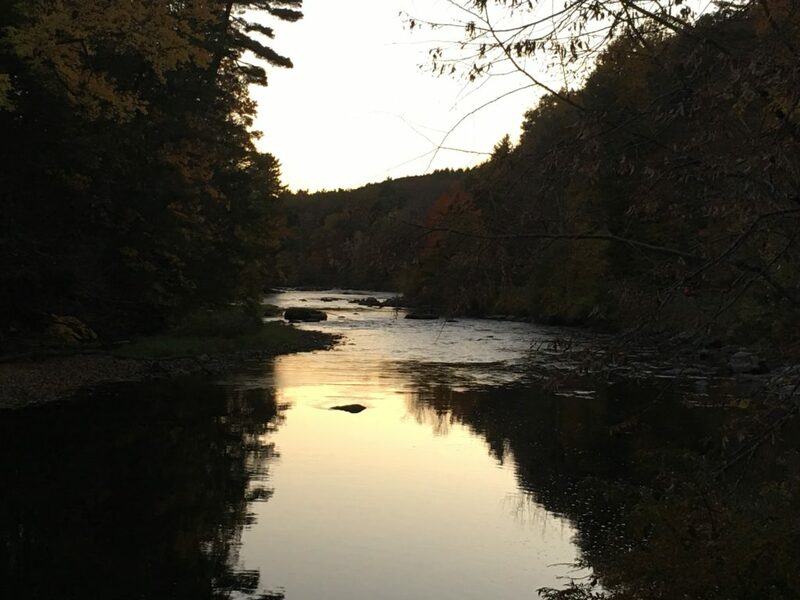 Housatonic — I don’t really remember too much of Jack London’s “Call of the Wild,” but I’ve never forgotten a short passage in the story when Buck and his master John Thornton turn away from civilization, traveling deep into the Northwest Territory. They come into a silent and melancholy lake country where there had been waterfowl just a month before, but where all was silent now, save the wind, the bare trees, and the lapping of black water. A walk out along the river in a late fall dusk engenders in me the same kind of feelings: quiet, but with a little age of unease. I walk in part to stop time, since I’ve read somewhere that movement freezes time, forestalls aging. But all around me is evidence of passage and change making my dream of timelessness as spare and gaunt as the stubble field I’m traveling. The path I follow is of made ruts worn into the stony dirt years ago when a farmer grew corn in this field and drove his tractor along this way. But there’s no corn anymore and no farmer either. Only the rough track remains. Whoever owns the field now keeps it mowed, holding the woods at bay both along the river and along the low ridgeline across the way where the land begins its climb up the mountainside. I travel on land another man owns. Shiny, orange, no-trespassing signs remind me someone may not want me here. The signs are relatively new, put up, I suppose, by the man keeps the land mowed. I think the signs can’t be for me. I mean no harm to his land or to any creature living there. And I’ve never once crossed his path in all the years I’ve wandered here. Turning for home I see crows roosting high a shagbark hickory, blacker than ever against the darkening sky. I’ve always felt a kinship with crows. I hope they’ll stay. But the watch crow betrays me, screams “trespasser.” I should’ve known crows claim the fields and valleys as their own for the cold months. The whole flock damns me as they spill from their perches and seek refuge in the hemlocks across the river. Thank you. It’s nice to see and read something nice on here. Maybe it is a woman mowing those fields? We’re very lucky to have those moments easily available. If we’re interested. Thanks.